My daughter (who has an nlrp12 mutation, but technically undiagnosed) was about 19 months old when she got her first “poke” of anakinra. Before anakinra, she was in pain, wouldn’t really run around, just kind of consistently lethargic. This video was taken about an hour after her first “poke”… she had been falling and crying all day prior to that first poke….. Be encouraged!! In the U.S. Kineret (anakinra) is only distributed to patients through their On Track system. Both the prescribing doctor and patient need to contact On Track to get the prescription filled. Call now if you have been prescribed Kineret to get this set up. You can also apply for co-pay assistance through On Track. If you are currently on Kineret and having any problems with your medicaiton or getting your medication, contact On Track immediately. 1-866-547-0644. Click here for the On Track website. If you are in the U.S. and have been prescribed Ilaris (canakinumab) contact the Ilaris Support Program for information on specialty pharmacies that distribute Ilaris, co-pay assistance, and to request a home health nurse to administer the injection. If you are currently on Ilaris and are having any problems with your medication or getting your medication, contact Ilaris Support Program immediately for help. 1-866-972-8315. Click here for the Ilaris Patient Support website. Produced by the Autoinflammatory Alliance, the “Healthier Ever After” book helps families with young children thrive and cope with frequent (and often very painful) injectable medications to help treat autoinflammatory diseases. The Debut of “Healthier Ever After,” Our Injection Tips Book for Autoinflammatory Diseases – This book teaches you how to prepare your child for injections with tips on discussing the medication with your child and by letting your child have as much control as possible over the process. 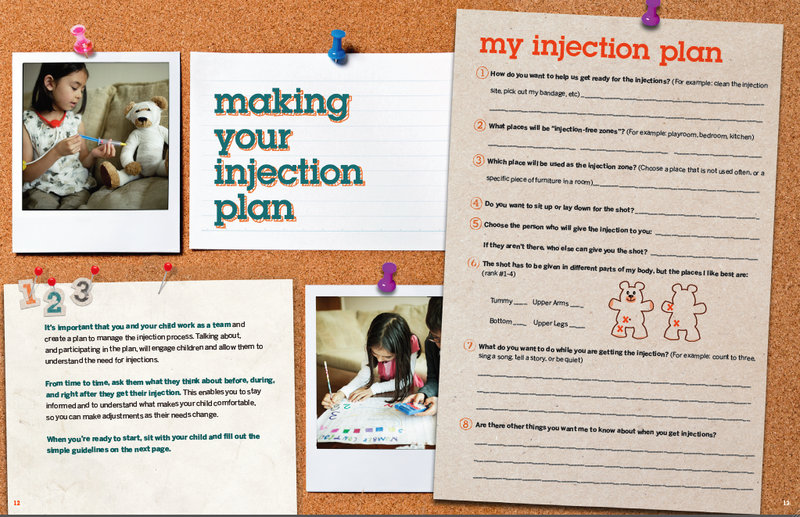 It includes step-by-step instructions, a questionnaire for your child to set up their own injection plan, tips for travel, and much more. How to Reduce the Pain of a Kineret (Anakinra) Injection – These tips come directly from our patient community. 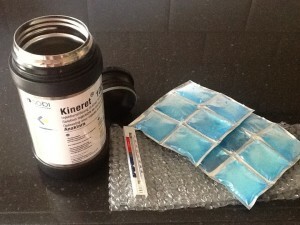 Kineret is a painful injection but there are ways to reduce the pain. Distraction Techniques to Reduce Pain and Anxiety for Your Child When Giving an Injection – Studies show you can reduce the brain’s pain center activity by using distraction techniques. 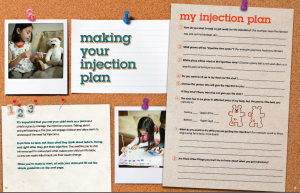 Here are some ways to distract your child while giving an injection. These work great for blood draws too. ShotBlocker and the Buzzy Bee for Shots Reviews – Do These Devices Stop Injection Pain? – A patient review of both the ShotBlocker and Buzzy Bee when used with Kineret injections. You can make your own travel cooler with a small thermos that fits into a purse. Medication Travel Cooler Bag Recommendations from Our Patient Community – The title says it all. See what travel bags and coolers our patient community recommends you use when traveling with your medications that must be kept cold. Keeping Medications Cold While Traveling – Tips for traveling with any medication that needs to be kept cold. This includes tips for packing, storing, and even camping with your meds. Flying in the U.S. with Medication – TSA regulations allow you to fly with any medication, including liquid medications. This covers how to fly with your medications. Click here for Kineret informational videos that include step-by-step injection instructions and tips for managing the injection site reactions. Kineret (Anakinra) Injection Site Reactions Video – A patient with Still’s Disease shows you in the video below what his injection site reactions looked like from using Kineret daily. It’s a very good visual reference of what to expect when starting Kineret and includes some tips on reducing these reactions. He notes that the most important thing is to be patient; the injection site reactions usually become less severe and frequent over a few weeks. Brave 4-year-old Girl Gives Herself Daily Anakinra Injections – This is Brinley who has clinical HIDS/TRAPS giving herself her daily shot. This is an excellent video to show young children who need shots to treat their disease. She is an inspiration to kids and adults. Thank you Brinley for sharing! Learn more about Brinley and her family at Blessings for Brinley. 4 year old getting Kineret injection – This little girl has NOMID, a form of CAPS. Another great inspirational video for kids and adults.